Item is sealed but has a replay sticker on. 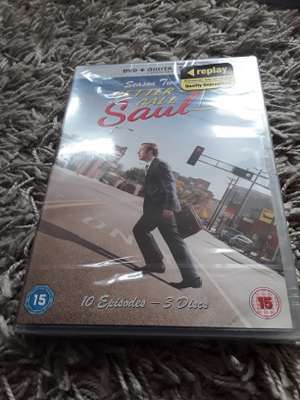 Had season 1 sat on a shelf since finished watching breaking bad. Couldn't …Had season 1 sat on a shelf since finished watching breaking bad. Couldn't bring myself to watch it as I didn't want to be disappointed because it wasn't breaking bad. Might give it a go. You may find the first season disappointing, but persevere as the next two are great. Brilliant series. If you enjoyed Breaking Bad you will definitely love this! Had season 1 sat on a shelf since finished watching breaking bad. Couldn't bring myself to watch it as I didn't want to be disappointed because it wasn't breaking bad. Might give it a go. Nothing is as good as Breaking Bad. Controversial I know but I enjoyed this series as much as breaking bad itself. It's a prequel to breaking bad centered around Walter's dodgy lawyer. Absolutely love it. A must see IMO. In a different way, I think this actually is. Controversial I know but I enjoyed this series as much as breaking bad …Controversial I know but I enjoyed this series as much as breaking bad itself. It's a prequel to breaking bad centered around Walter's dodgy lawyer. Absolutely love it. A must see IMO. Isn't Trevor from GTA5 in season 2? Pretty good if you're a Breaking Bad fan or have recently watched it. I disagree. It’s good and if you’re not a breaking bad fan it’s better. Breaking bad was good, but it’s crap now. People need to move on. You may find the first season disappointing, but persevere as the next two …You may find the first season disappointing, but persevere as the next two are great.